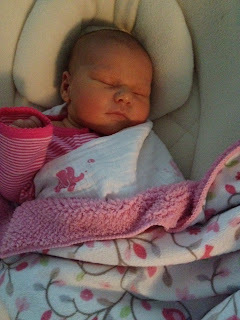 Hoosier Farm Babe : Baby Sissy is Here!! Miss Ruby May was born on Thursday, May 16, 2013 at 6:04 p.m. weighing 8 lbs. 12 oz., 20 1/4 inches long. She is absolutely beautiful! We are VERY blessed! More photos and hopefully, the birth story to follow ... Stay tuned! Was wondering of the new baby had arrived. She is adorable!! Congratulations on all of the excitement in your life. I enjoyed reading your blog. Would love to catch up with you and Dallas sometime. Drew tipped me off that he & Naomi joined you guys on vacation. That is awesome. Tell Dallas I said hello and hopefully sometime we can find a time. I have someone special to bring with me unlike the three or four other times I was able to join the AGR boys and their wives. Take care. Best wishes for a great harvest.